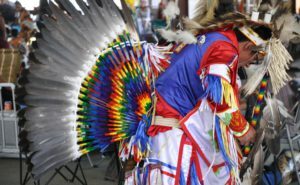 Salish and Kootenai Powwow Celebrations - S&K Technologies, Inc.
During the summer, much of western Montana becomes a tourist hotspot with many recreational activities. The Confederated Salish and Kootenai Tribes have capitalized on this increase in tourism by providing gaming, resort, marina, and cultural activities to entice tourists to visit the Flathead Reservation. The Reservation is comprised of two Nations with two separate and distinct languages, the Salish and the Kootenai people, hence the “S&K” in our company name. During the month of July (Salish: “Month of Celebration” and Kootenai: “Ripening of Service Berries”), both Nations—Salish and Kootenai—have their celebration or powwow. This is a chance for each Nation to show their different styles of dance and song. Gathering of Native American people and tribes for the trade of goods has been a tradition for thousands of years. 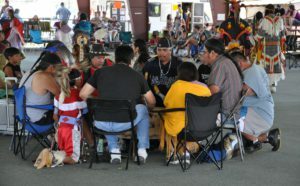 These gatherings usually include trade, dance, songs, and games. More recently these gatherings have been called celebrations or “powwows.” One of the oldest known “modern powwows” is on our very own reservation in Arlee, Montana. The Arlee Fourth of July Celebration is in its 114th year, dating back to 1898. Although gathering of Native Americans for cultural reason was outlawed in the United States in 1898, the Salish decided to have a celebration on America’s Independence Day and include some of their cultural ceremonies. It wasn’t against the law for the Salish people to celebrate America’s Independence Day, even though they were not American citizens, so it became their loop hole. A drum group plays at the Arlee Powwow. Large, handmade drums that carry a larger bass sound are used primarily for powwows or large community gatherings. They can be heard miles away, often echoing throughout the powwow grounds and surrounding valleys. The songs produced on the larger drums are honor songs, powwow songs, flag songs, veteran songs, and inter-tribal songs. Song styles are very diverse throughout Indian Country. Naming of the drum groups usually depends on the area they represent. Some larger groups might represent many tribal nations. Northern drums often sing at a higher octave falsetto. Southern drums will often sing a lower-toned song. Larger powwows sometimes separate the northern and southern drums in competition due to their diversity. A typical powwow includes dance, song, vendors, traditional games, and sometimes rodeos. Still, the focal point of many powwows is the dance and song. Dancers and drummers travel from all over to attend powwows to either compete in dance and drum competitions or just dance because they want to. Dance competitions are separated by male/female, age, dance categories, and sometimes southern/northern. Similarly, drumming competitions are all-around, but may be separated by northern/southern. Northern dancers/drummers are typically from the northern part of the US and Canada. Southern dancers/drummers are from the southern part of the US and Mexico. Although northern and southern are different in style, contemporary dancers and singers borrow from one another making the powwow experience more unified. Spectators enjoy the sun and competition at the Arlee Powwow basketball tournament.